italy | ATTACK OF THE RED ENVELOPES! Before watching this movie, I watched the original movie from 1969, starring Michael Caine. This is an exercise I like to do to draw comparison between the original and the update in terms of quality, performance, and homage. This is something I will do often, so don’t be surprised if you see back-to-back reviews of originals and remakes like this in the future. Anyway, let’s get on with the show. Mark Wahlberg stars as Charlie Croker, a professional thief who, in the beginning of this movie, pulls off a successful heist of over $35 million in gold buillion in Venice. But the bulk of the movie’s story takes place a year later in Los Angeles. So, unlike the original movie, The Italian Job is not centered around the gang trying to steal the gold. But it is about how one member, Steve (Edward Norton) betrayed them by taking the haul for himself, and how the others make plans to take it back from him. So, essentially, this movie isn’t about the robbery; it’s about the gold itself. So, what does this movie have in common with the original? Well, Charlie is still here, and so is Mr. (John) Britcher (Donald Sutherland). Seth Green takes over the comic relief reins as the computer whiz, only this time he obsesses about a former college roommate who stole his idea (Napster). And of course, the Minis. You can’t have this movie without Minis. This movie was entertaining from start to finish. Wahlberg leads the ensemble cast with a casual energy, and his chemistry with the others (Green, Charlize Theron, Jason Statham, and Mos Def) is very apparent. The script was a cut above that of your average action movie, and F. Gary Gray’s direction put a fresh twist on the genre. I guess it goes without saying that I liked this movie. I will say this: having a bus hang precariously off a ledge along Mulholland Drive probably would not have worked as an ending. The Italian Job is a well-paced, fun action film with (mostly) likable characters (Edward Norton’s Steve is a slimeball, and he plays his character with aplomb). This is one movie I may actually consider buying. For years, I had heard about the now-famous cliffhanger ending in 1969’s The Italian Job, and I wondered why would the makers of this movie allow it to end this way. Now that I have seen the movie, I must say that it works. Normally, I’d consider this a spolier, but in this case, the movie is about the journey, not the destination. At the end of the movie, the bus carrying the crooks and the gold skids out of control and hangs precariously over the edge of a cliff, the crooks at one end, the gold at the other (It’s pretty easy to guess which is at which end). Then Charlie Croker (Michael Caine) says he has an idea, and… roll credits! Frankly, it is gags like this that make this movie so irreverently 60s, so amusing, so… British. On top of Caine’s ex-con with a shot at the big time, there is Noel Coward’s incarcerated flambouyant ringleader with a just-this-side-of-creepy fascination of Queen Elizabeth II, Maggie Blye as Croker’s girlfriend, who arranges a welcome home “party” with several ladies for him (only to go into a fit of rage when he tries to bed three more girls on his own), and Benny Hill’s nutty professor with a perverse predaliction toward women who are, shall we say, plus-sized. Yes, this is a Rated-G movie. By today’s standards, it would likely be a PG, but it sill makes for a fun-to-watch caper movie. I, for one, find it suitable for nearly all audiences. But if you like classic exotic automobiles, you’d better prepare to weep. Fiats, Lamborghinis, Jaguars and (of course) Mini Coopers get literally tossed over cliffs throughout the film. And who could forget those Mini Coopers? 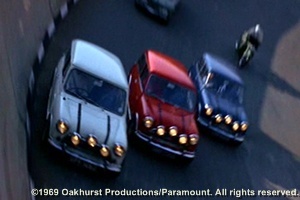 The chase scene of the three Minis escaping from the overly-congested streets of Turin, Italy, is one of the most unique ever filmed. Some indoor sequences of the chase undoubtedly were an inspiration for the infamous mall chase in The Blues Brothers 11 years later. Watching these three cars jump over roofs, crawl up the sides of sewers, and plow though a river was purely entertaining. I would not consider The Italian Job a classic. But it is fun, energetic, and very British. If you like wry comedy, this would fit in just nicely.